Putting up holiday decorations is a sure way to draw attention to your house but that’s a good. You’re showing your spirit of the season. It’s also a lot of fun and certainly makes the name look a lot more festive. In fact, some neighborhoods are so into the holiday spirit that their streets become tour destinations. You might not want that kind of traffic but you still want to make things look merry and bright. Before you put the decorations up, you need to bring in Junk King Sarasota. These are the junk removal professionals who can help clear away all kinds of unsightly yard debris. That will certainly make those decorations look a lot better! Junk King Sarasota is can provide you with your own dedicated team of movers. This is the crew who is going to do all the actual work for you. They do want to see you lifting one sticker furniture or single box. Some people feel the need to bring all the junk items down to the curb. This is how the garbage picks up everything, right? But that’s not how Junk King Sarasota operates. You leave everything right where it is and they’ll pick it up right from the spot. It doesn’t matter to them how heavy something might be. All that matters is that you want it gone. Weight is never a factor with Junk King Sarasota and that makes a huge difference especially when you clearing out yard debris. You can call on the team to take away anything from palm fronds to chunks of concrete. It will all go on the back of the truck. Once everything is loaded you can get back to your day. Of course, the work for Junk King Sarasota is far from over. Back at the depot, they’ll do a lot of sorting through all the things they’ve collected. They’re going to pull out any items that could be donated or recycled. This is part of their process. Although it may add a few extra steps will be paying any extra dollars! 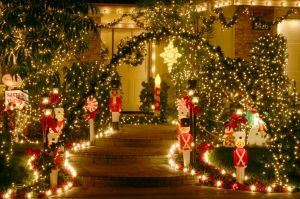 Make sure your home looks festive this holiday with a junk clearing session from Junk King Sarasota. This entry was posted in junk removal and tagged clutter, decorations, Junk King, junk removal on November 30, 2016 by Tomas Jasek. Last updated August 15, 2017 .